The Chair declared the meeting open at 10.30am. That the apologies from the Independent Financial Advisor and GM Regulatory Services for delayed arrival be received. It was advised that councillors should make declarations item-by-item as the meeting progressed. That the report ‘Health and Safety Report’ by Tracey Warboys, Health and Safety Specialist and dated 7 June 2018, be received. That the minutes of the council meeting held on 15 May 2018 be confirmed as a true and correct record. That the action sheet be received. That the report ‘Council Working Party Updates and Chairpersons’ Briefings’ be received. That the report ‘Council Working Group Updates’ be received. That the report ‘Financial Report to 31 May 2018’ by Vincent McColl, Financial Accountant and dated 6 June 2018, be received. 1. That the report ‘2018 Representation Arrangements Review Initial Proposal’ by Chris Taylor, Governance Support Manager and dated 14 May 2018, be received. a) The Northland Regional Council comprises nine (9) councillors elected from seven (7) constituencies. b) The proposed names and boundaries of the seven (7) constituencies be as described and illustrated in the Initial Proposal included as Attachment 2 (pertaining to Item 6.1 of the 21 June 2018 council agenda). ii. Two (2) members to be elected by the electors of the Coastal North and Whangārei Urban constituencies. iii. With the exception of the Hokianga-Kaikohe constituency, in determining the number of councillors to be elected by the electors of each constituency the changes being proposed satisfy section 19V of the LEA 2001, which provides for fair representation. iv. The Hokianga-Kaikohe constituency does not comply with section 19V of the LEA 2002 in order to maintain effective representation for an isolated community. e) The Initial Representation Arrangements Proposal included as Attachment 2 to this report, be adopted and submitted for formal public consultation in accordance with the requirements of the Local Electoral Act 2001, and that the CEO be authorised to make any changes to the proposal arising from its final editing. f) The Representation Arrangements Review Hearings Committee be a committee of all councillors. 3. Due to the tight timeframes of the Representation Arrangements Review, late submissions will not be accepted. 1. That the report ‘Adoption of the Long Term Plan 2018-2028, Revenue and Financing Policy, Financial Contributions Policy, Significance and Engagement Policy, Financial Strategy and Infrastructure Strategy’ by Malcolm Nicolson, Chief Executive Officer and dated 23 May 2018, be received. 2. That having undertaken consultation in accordance with sections 82 and 82A by way of the Special Consultative Procedure in accordance with section 87, and pursuant to section 76AA of the Local Government Act 2002, the council adopt the Significance and Engagement Policy (as included in the final draft Long Term Plan 2018–2028, attached under separate cover). 3. That in accordance with the requirements of sections 101A and 101B of the Local Government Act 2002, the council adopts the Financial Strategy and Infrastructure Strategy as included in the final draft Long Term Plan 2018–2028 (attached under separate cover). 4. That, having undertaken consultation in accordance with the Special Consultative Procedure, and pursuant to section 93 of the Local Government Act 2002, the council adopts as its Long Term Plan 2018–2028 the final draft Long Term Plan 2018-2028 (attached under separate cover). 6. That council delegate to the Group Manager – Governance and Engagement the authority to approve any minor accuracy, grammatical, typographical or formatting amendments to the Long Term Plan 2018–2028 prior to it being published. Secretarial Note: Congratulations and appreciation were extended to all staff involved in the Long Term Plan process. 1. That the report ‘Adoption of the Charging Policy 2018/19’ by Kyla Carlier, Strategy Specialist and dated 14 May 2018, be received. 2. That council adopts the Charging Policy 2018/19 as included in the supporting information to this report. 3. That council authorises Jonathan Gibbard, Group Manager –Governance and engagement to make any necessary minor drafting, typographical, rounding, or presentation corrections to the Charging Policy 2018/19 prior to the document going to print. 1. That the report ‘Rating Considerations Under Section 100T of the Biosecurity Act 1993’ by Don McKenzie, Biosecurity Manager and dated 24 May 2018, be received. 2. That council adopts the section 100T analysis for the purpose of setting the Pest Management Rate, as set out in the Funding Impact Statement of the Long Term Plan 2018–2028. 1. That the report ‘Rates for the year 1 July 2018 to 30 June 2019’ by Dave Tams, Group Manager, Corporate Excellence and dated 7 May 2018, be received. The Whangārei District targeted council services rate amount of $91.96 (including GST) per SUIP includes funding for the Hātea River Channel amount of $1.73 (including GST). Urban rate class UA (floodplain location) $298.11 direct benefit plus $30.17 indirect benefit per separately used or inhabited part of a rating unit (SUIP). Urban rate class UA – commercial differential. Urban rate classes UF (higher ground) $30.17 direct benefit plus $30.17 indirect benefit per separately used or inhabited part of a rating unit. Urban rate class UF – commercial differential. 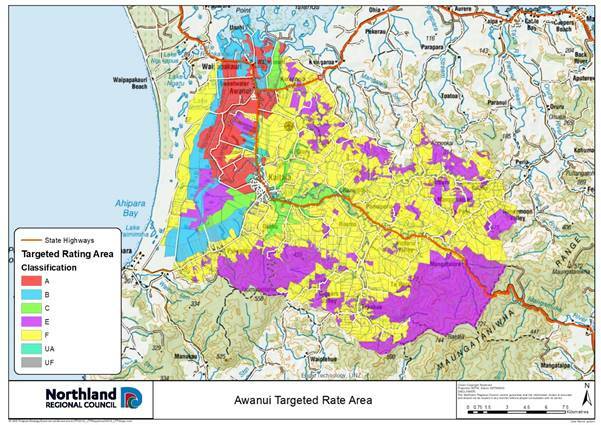 Rural rate differentiated by class, $13.50 per separately used or inhabited part of a rating unit (SUIP) of indirect benefit plus a rate per hectare for each of the following classes of land in the defined Kaitāia flood rating district as illustrated in the following maps and table. 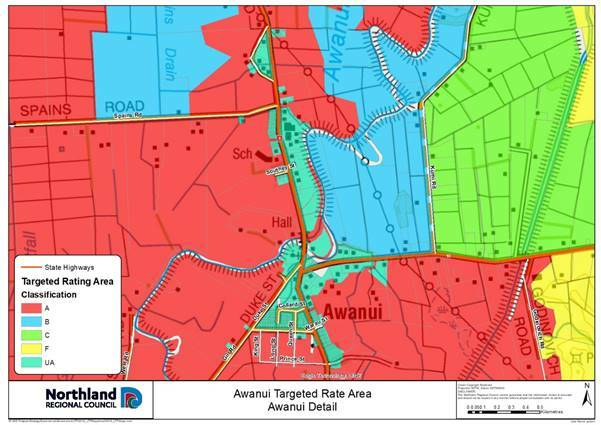 High benefit; rural land which receives high benefit from the Awanui scheme works due to reduced river flooding risk and/or reduced duration of flooding and/or coastal flooding – all rateable land other that in the commercial differential. Moderate benefit; land floods less frequently and water clears quickly – all rateable land other that in the commercial differential. Contributes runoff waters, and increases the need for flood protection - all rateable land other that in the commercial differential. Land on the floodplain and side valleys downstream of Rotu Bottleneck. Class B – land on the floodplain and tributary side valleys between Ahikiwi and the Rotu Bottleneck and in the Mangatara Drain catchment upstream of SH12. 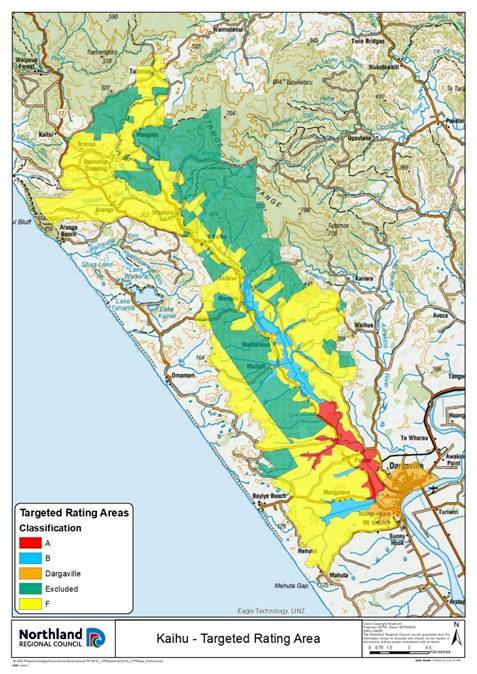 Land within the Kaihū River rating area not falling within Class A and Class B. Residential properties in the Whangārei central business district (CBD) flood area are defined as all rating units which are used principally for residential or lifestyle residential purposes, including retirement villages, flats etc. Residential properties also includes multi-unit properties, these being all separate rating units used principally for residential purposes, and on which is situated multi-unit type residential accommodation that is used principally for temporary or permanent residential accommodation and for financial reward, including, but not limited to, hotels, boarding houses, motels, tourist accommodation, residential clubs and hostels but excluding any properties that are licensed under the Sale and Supply of Alcohol Act 2012. 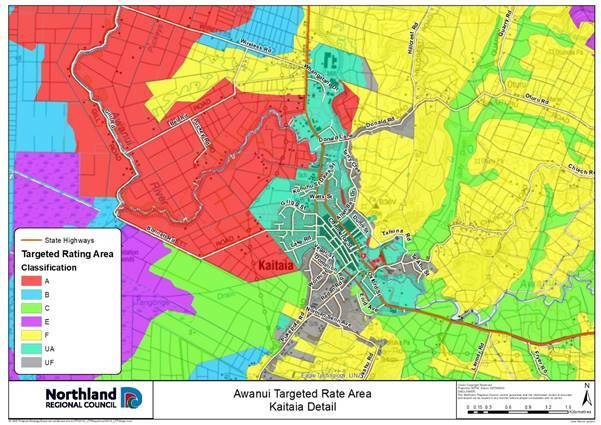 Commercial properties in the Whangārei CBD flood area are all separate rating units used principally for commercial, industrial or related purposes or zoned for commercial, industrial or related purposes in accordance with the Whangārei district plan. For the avoidance of doubt, this category includes properties licensed under the Sale and Supply of Alcohol 2012; and private hospitals and private medical centres. · In accordance with section 58(1)(b) of the LGRA, a penalty of ten per cent (10%) of the amount of all Kaipara District constituency rates (including any penalties) from any previous financial years that are unpaid on 01 July 2018 will be added on 05 July 2018. · In accordance with section 58(1)(c) of the LGRA, a penalty of ten per cent (10%) of the amount of all Kaipara District constituency rates to which a penalty has been added under the point immediately above and which remain unpaid will be added on 05 January 2019. · In accordance with section 58(1)(b) of the LGRA, a penalty of ten per cent (10%) will be added to any Whangārei District constituency rates (including any penalties) from any financial year prior to 1 July 2018 that still remain unpaid as at 01 July 2018. This penalty will be added on 3 September 2018. 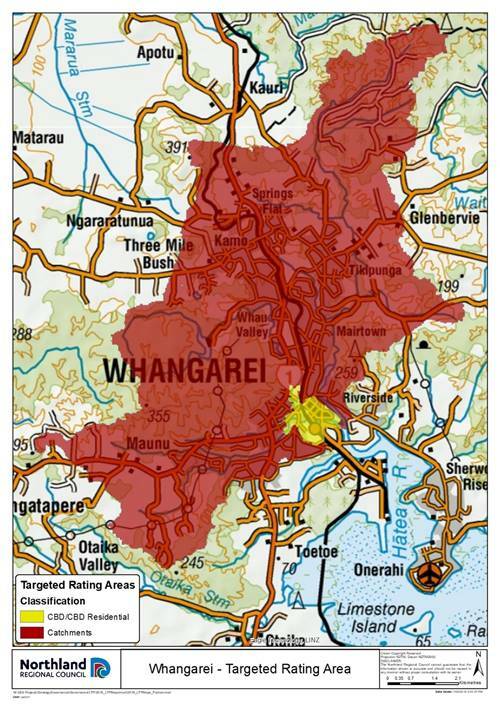 · In accordance with section 55(3) of the LGRA, where the total rates assessed for the 2018/19 year and any arrears on a rating unit in the Whangārei District constituency are paid in full on or by the due date of the first instalment, a discount of two percent (2%) of the total rates assessed on that rating unit in the 2018/19 financial year will be applied. 1. That the report ‘Adoption of rating policies effective 1 July 2018’ by Bree Torkington, Assistant Management Accountant and dated 30 May 2018, be received. 2. That having undertaken consultation in accordance with sections 82 and 83, and pursuant to section 102 and sections 108-110 of the Local Government Act 2002, and sections 55 and 56 of the Local Government (Rating) Act 2002, and having considered Schedule 11 of the Local Government Act 2002, the council adopt the rating policies for the Kaipara district and Whangārei district (including the Policy on the Remission and Postponement of Rates on Māori Freehold Land), effective from 1 July 2018, included on pages 14-28 of the attachment pertaining to supplementary item 6.6 of the 21 June 2018 council agenda. 3. That council authorise Dave Tams, Group Manager – Corporate Excellence, to make any necessary minor drafting, typographical, or presentation corrections to the rating policies prior to the document going to print. 1. That the report ‘Investment and Growth Reserve: Enabling Investment Allocation - Extended Regional Promotions’ by Darryl Jones, Economist and dated 6 June 2018, be received. 2. That council agree to allocate $200,000 in each of the next three financial years (i.e. 2018/19–2020/21) from the Investment and Growth Reserve to Northland Inc. to undertake regional promotion activities. 3. That council delegates to the Chief Executive Officer the arrangements for allocating of the funding. 4. That Northland Inc. provide council with six-monthly reporting to council on performance measures set out in the proposal. Secretarial Note: Items 6.8 and 7.3 were addressed following Item 8.0 to allow for the attendance of Northland Inc. Limited representatives. 1. That the report ‘Northland Inc. Limited: Statement of Intent 2018-2021’ by Darryl Jones, Economist and dated 5 June 2018, be received. 2. That council agree to Northland Inc. Limited’s Statement of Intent 2018–2021 as set out in Attachment 2 pertaining to Item 6.8 of the 21 June 2018 council agenda. 1. That the report ‘Making of section 8 (Disease and pathogens) and section 10.1 (Marine Pathway Management Plan) of the Northland Regional Pest and Marine Pathway Management Plan 2017-2027’ by Don McKenzie, Biosecurity Manager and dated 7 June 2018, be received. 2. 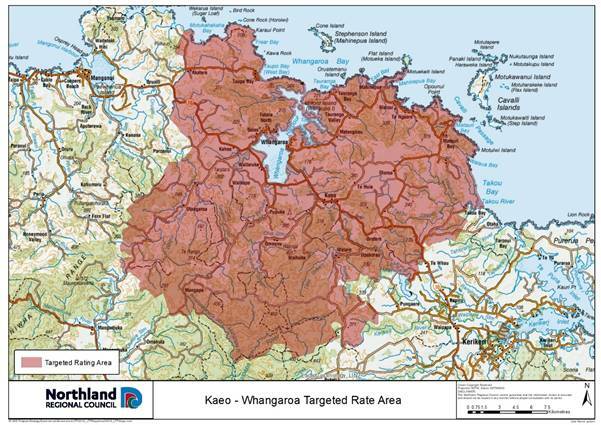 That council make section 8 (Disease and pathogens) of the Northland Regional Pest and Marine Pathway Management Plan 2017–2027 in accordance with section 77(1) of the Biosecurity Act 1993 by fixing the council seal to section 8 (Disease and pathogens) of the Northland Regional Pest and Marine Pathway Management Plan 2017–2027 as attached to the report to council ‘Making of section 8 (Disease and pathogens) and section 10.1 (Marine Pathway Management Plan) of the Northland Regional Pest and Marine Pathway Management Plan 2017-2027’ dated 29 May 2018. 3. That council make section 10.1 (Marine Pathway Management Plan) of the Northland Regional Pest and Marine Pathway Management Plan 2017–2027 in accordance with section 97(1) of the Biosecurity Act 1993 by fixing the council seal to section 10.1 (Marine Pathway Management Plan) of the Northland Regional Pest and Marine Pathway Management Plan 2017–2027 as attached to the report to council ‘Making of section 8 (Disease and pathogens) and section 10.1 (Marine Pathway Management Plan) of the Northland Regional Pest and Marine Pathway Management Plan 2017–2027’ dated 29 May 2018. 4. That 1 July 2018 is the date section 8 (Disease and pathogens) of the Northland Regional Pest and Marine Pathway Management Plan 2017–2027 commences in accordance with sections 77(5) and 97(5) of the Biosecurity Act 1993. 5. That 1 July 2018 is the date section 10.1 (Marine Pathway Management Plan) of the Northland Regional Pest and Marine Pathway Management Plan 2017–2027 commences in accordance with sections 77(5) and 97(5) of the Biosecurity Act 1993. 6. That Bruce Howse, Group Manager – Environmental Services, be delegated authority to make minor grammatical or formatting amendments to section 8 (Disease and pathogens) and section 10.1 (Marine Pathway Management Plan) of the Northland Regional Pest and Marine Pathway Management Plan 2017–2027 as necessary prior to the date of commencement as per section 100G(4) of the Biosecurity Act 1993. 1. That the report ‘Amendment to the Northland Regional Council/Northland Transportation Alliance Procurement Strategy 2017 to 2021’ by Peter Thomson, Northland Transportation Alliance Manager and Chris Powell, Transport Manager and dated 6 June 2018, be received. · Reference the fact that whilst the Northland Transportation Alliance Procurement Strategy 2017 to 2021 is the overarching Regional Procurement Strategy, the NRC Public Transport Procurement Strategy is currently a sub strategy, which will expire in June 2018, and not be replaced. · Change references to ‘direct appointment’ in Table 5 to be consistent with the wording in the NRC PT procurement strategy (‘appropriate supplier selection method’). 1. That the report ‘Investment Subcommittee and Property Subcommittee Membership’ by Dave Tams, Group Manager, Corporate Excellence and Phil Heatley, Strategic Projects Manager and dated 1 June 2018, be received. 2. That council approves Cr Stolwerk as an alternate member of the Investment Subcommittee. 3. That council approves Cr Stolwerk as an alternate member of the Property Subcommittee. 4. That the Terms of Reference for each respective subcommittee be updated accordingly. 1. That the report ‘Amendment to delegations’ by Justin Murfitt, Resource Management Planning and Policy Manager and dated 6 June 2018, be received. 2. That council delegates authority to the Resource Management Planning and Policy Manager and the Group Manager – Regulatory Services to settle appeals by way of mediated agreements where council is an interested party under section 274 of the Resource Management Act 1991. 3. That the Delegations Manual be amended accordingly to reflect recommendation 2 above and to make other minor changes for consistency and clarity. That the report ‘Chair's Report to Council’ by Bill Shepherd, Chairman, and dated 1 June 2018, be received. Secretarial Note: Councillor Yeoman noted that she had not attended the Karikari estate event and requested that the report be amended accordingly. That the report ‘Chief Executive’s Report to Council’ by Malcolm Nicolson, Chief Executive Officer and dated 21 June 2018, be received. · Appreciation was extended to the Biosecurity team for their work on the pest programme. · Items 6.8 and 7.3 were addressed following Item 8.0 to allow for the attendance of Northland Inc. Limited representatives. That the report ‘Northland Inc. Limited: Reporting Against Statement of Intent - Quarter Three 2017/18’ by Darryl Jones, Economist and dated 5 June 2018, be received. Secretarial Note: Item 8.0 was address prior to Items 6.8 and 7.3 to allow for the attendance of Northland Inc. Limited representatives. The public conduct of the proceedings would be likely to result in disclosure of information, as stated in the open section of the meeting. The public conduct of the proceedings would be likely to result in disclosure of information, the withholding of which is necessary to protect the privacy of natural persons, including that of deceased natural persons s7(2)(a). The public conduct of the proceedings would be likely to result in disclosure of information, the withholding of which is necessary to enable council to carry out, without prejudice or disadvantage, commercial activities s7(2)(h) and the withholding of which is necessary to enable council to carry on, without prejudice or disadvantage, negotiations (including commercial and industrial negotiations) s7(2)(i). 3. That the Independent Financial Advisor be permitted to remain during business with the public excluded. The meeting concluded at 11.55am.